Exercising with Rheumatoid Arthritis can be difficult, but you can make it fun. Try our recommendations and get back on track in no time. When coping with RA (Rheumatoid Arthritis), having flexible joints and leading an active lifestyle may seem like things of the past, but they don’t have to be. Getting your blood flowing and maintaining good heart health are crucial factors in managing RA pain, on top of simply making you feel better as a whole. While it can be painful to bend or stretch your achy joints, simple and low-stress stretches can help extend their life (and put some “bounce” in your step again!). Water exercise is incredibly effective, while being low-impact, and incredibly fun. 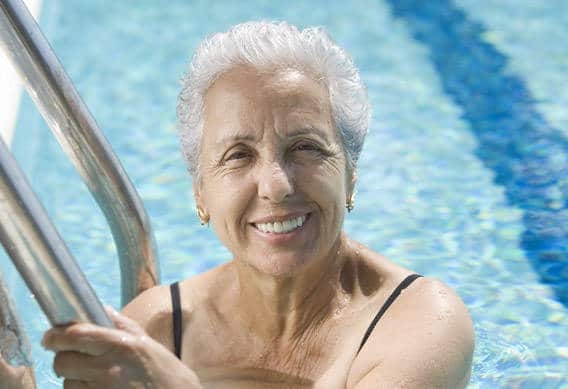 Try swimming in a pool (heated ones are best to limber up stiff joints, but they’re not always easy to find) a few times per week, for half an hour per day. In many cities across the US, classes are available, via recreation centers and gyms, designed for patients with pain conditions like Rheumatoid Arthritis. Many people are nervous about re-engaging in public activities after periods away from it, but classes designed for pain patients are filled with folks in the same situation as you, and can help you overcome your hurdles. If you don’t happen to have classes like this available to you, start slow, with gentle strokes, and work up toward swimming laps of various strokes. The key is to get started, and to keep moving as much as possible. Swimming can improve joint tenderness and range of movement in as few as 4 weeks, so long as activity is regular. If you hit your local gym, connect online with others in your community, or look through the classified section of your local newspaper, you’ll easily find exercising classes focusing on balance, slow & gentle stretching, and mental focus, which are ideal for arthritis patients. Yoga and Tai Chi are two great examples of exercising regimens that help improve balance and joint mobility, while strengthening surrounding muscles. Fitness & community centers often have these types of classes several times per week, and sometimes have specific classes for patients of pain conditions. While you are at the gym, enlist the help of a personal trainer to plan a special workout routine for you that will focus on strengthening your muscles, lengthening your ligaments, and promoting cardiovascular health. Stronger muscles ease & distribute the impact dealt to your joints, so strength training is often recommended to be practiced alongside other forms of exercise. If you’re not currently being seen by one, ask your doctor to refer you to a physical therapist. They can provide you with a list of stretches specifically designed for your condition, weight, abilities, and needs. Remember to do them everyday! The best times to practice are in the morning, just after you get out of bed, and in the evening, when you are beginning to wind down at the end of your day (and if you can incorporate them throughout your day, go for it! ).